How many buildings did you see being built today? This is what makes a career in construction is a great path to pursue. Houses are constantly being built, and new or renovated buildings are popping up all the time, showing that the demand for construction is most definitely there. Construction can be easy to get into, but if you want to take your career to the next level then there are some steps you should take. Learn how to achieve a successful construction career with these tips on getting ahead. The world of construction is vast, and there are a lot of avenues you might want to consider. A look at construction careers will show you that there are plenty of paths to pursue – and you could learn multiple disciplines to make you a great trader. Beyond labour-based roles, you’ll have management opportunities, so if you’ve got your sights set on working up – make sure you know what you’re aiming for. While a lot of construction skills are learnt on the job, getting some formal training will make you a more desirable candidate to building companies or even help you if you decide to go freelance in the future. Safety is a very important element of construction, and more and more employers will want to see that you’ve had the right training for the job. Get assessed for your CSCS Card which will validate your experience and boost your qualifications. While learning on the job has its benefits, it doesn’t hurt to undertake some formal training too. The path to promotion can be very competitive, so if you’re serious about progressing in your construction career then you’ll need to actively seek opportunities. Be curious on site by asking questions, paying attention and taking an active interest in the work that you’re doing. Enthusiasm and passion will be noticed at work and if you can show that you’re willing to take on extra responsibilities and tasks then a promotion could be in your near future. Experience matters in construction and soaking up as much experience as you can will help you to advance in your career. After working for companies for a number of years, the next step for you could be to go it alone. 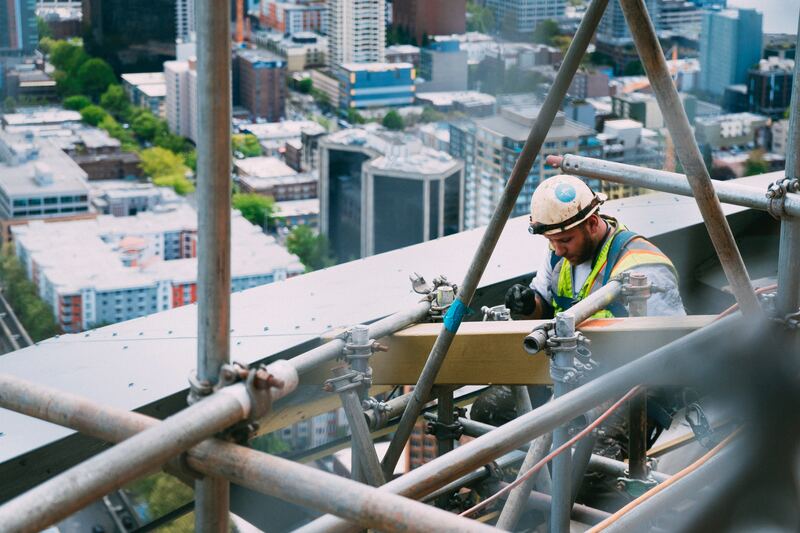 There are several pros and cons to consider when going freelance in the construction industry, so think about things carefully before you go for it. Make sure you build up some contacts and consider taking on additional work alongside your normal role to give you some financial security while you’re getting things off the ground. Whatever your future career ambitions, the construction industry is a great industry to develop a career in. Explore local opportunities near you to join this exciting and fast-paced industry and start your journey to getting ahead with your construction career.